I've seen some magnificently decorated Christmas trees coming through my Facebook stream over the past few weeks - each one has it's own unique charm and personality. So today, I've created another version of Christmas tree earrings, called simply, O, Christmas Tree! I think you'll agree that the three versions I've made each have a personality of their own too and they couldn't be more different from each other: leather trees, wire wrapped trees and now, filigree trees. 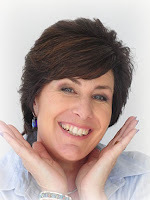 Filled with glowing red beads and edged with sparkling gold crystals, these are statement earrings for those who dare to be bold - they measure a neck-tickling 7cm (2 ¾") from the top of the ear wire to the bottom of the basket! Other: drill with 1 or 2mm drill bit or metal punch; block of wood. 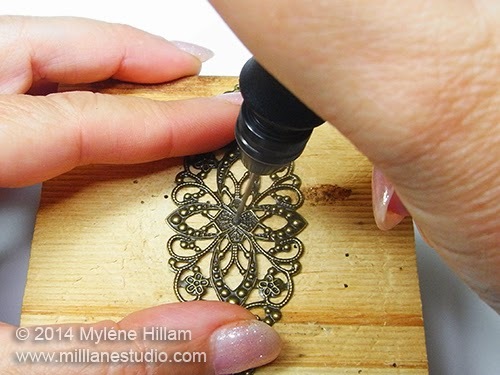 Place the filigree on the block of wood and drill a hole in the centre. 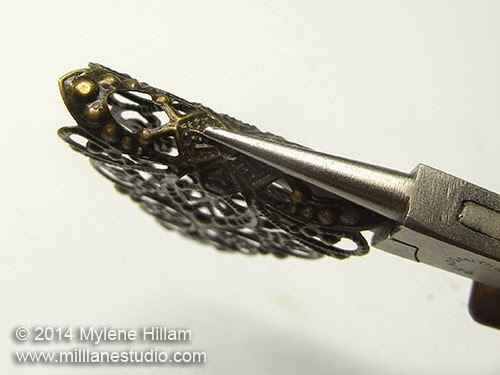 Place the narrow jaw of the bail making pliers in the centre of the filigree and bend both sides down. Try to keep the two halves aligned. Finish the shaping with round nose pliers to make the base narrower. 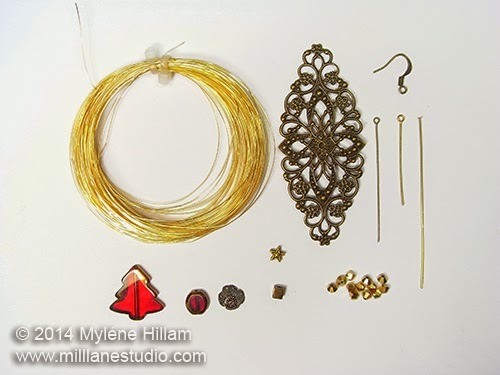 Insert the brass (or gold) eye pin through the bottom of the filigree and string on the two red beads. 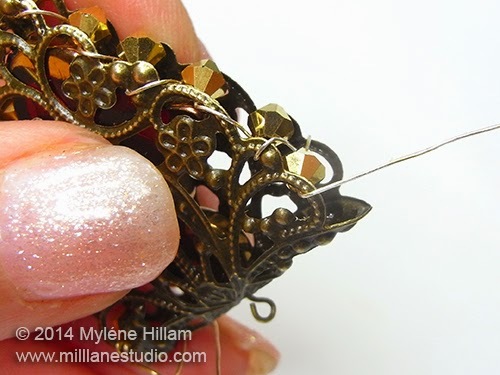 Centre them in the Christmas tree and then bend the tail of the eye pin over the top of the filigree. 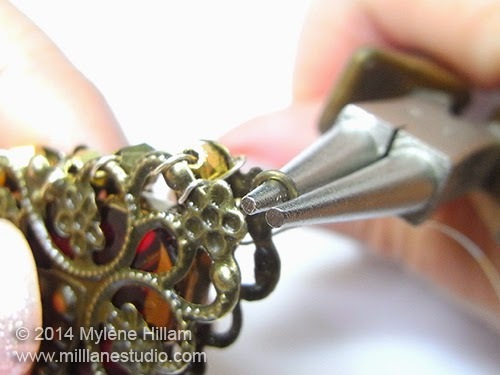 Then bend it so that it sits flush against the filigree to keep it out of the way whilst you complete the next step. 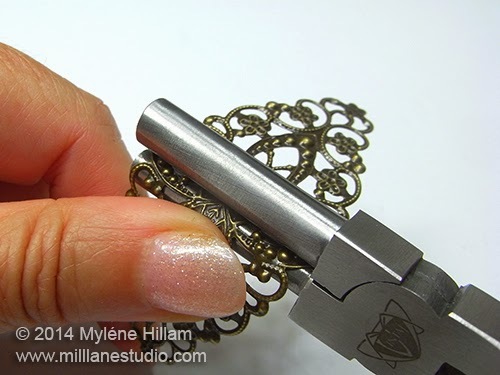 Cut 50cm wire and insert the wire from the inside first, through the hole closest to the bend in the filigree. Wrap the wire three or four times around the edge. 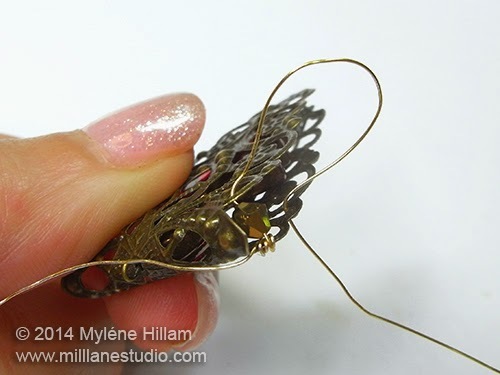 String on a bicone and then insert the wire through the corresponding hole on the other side of the filigree, from the inside out. Take care not to kink the wire as you feed it through. Feed the wire back through to the first side again (from the inside), taking care not to kink it or break it. All your wraps will be over the outside edge first, through the middle of the two filigrees and then outside through the corresponding hole (from the inside). Continue adding beads on every second pass until you have added 6 beads. 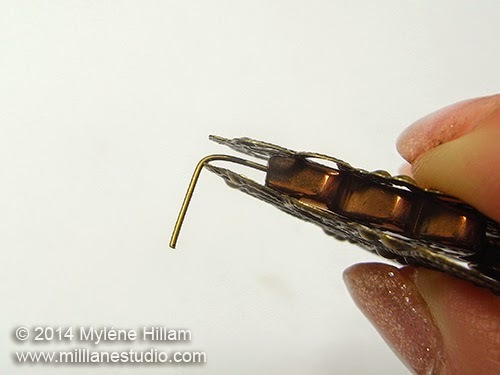 Straighten the wire by running it through the nylon jaw pliers from time to time. 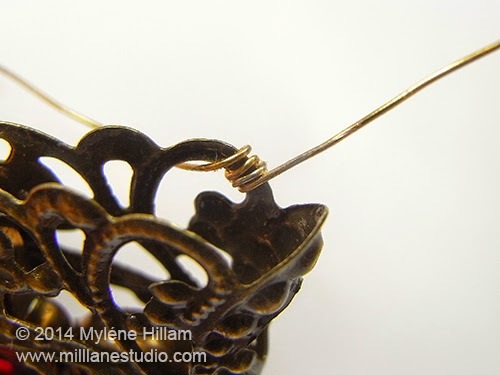 After the 6th bead has been added, bend the tail of the eye pin back to 90° and wrap the wire around it two or three times to anchor the eye pin. 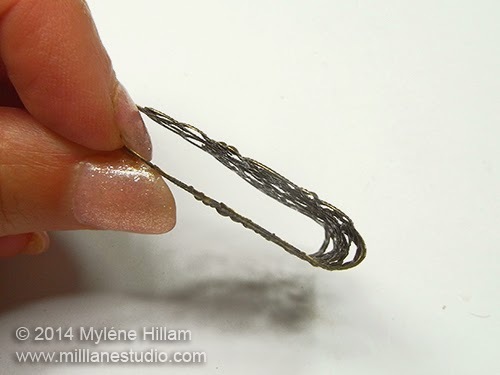 Turn a simple loop on the eye pin. 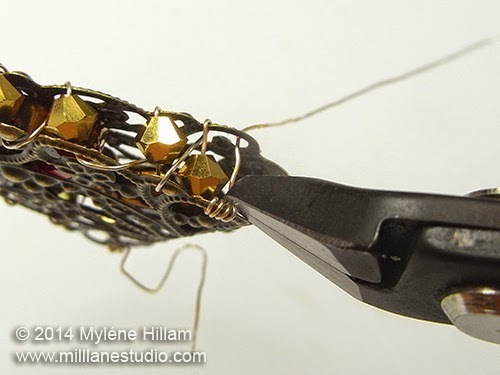 Continue wrapping the wire around the filigree, adding beads to every second pass. 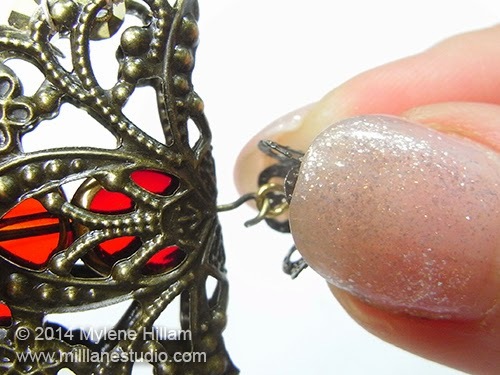 Once six beads have been added, wrap the wire around the last hole three or four times. 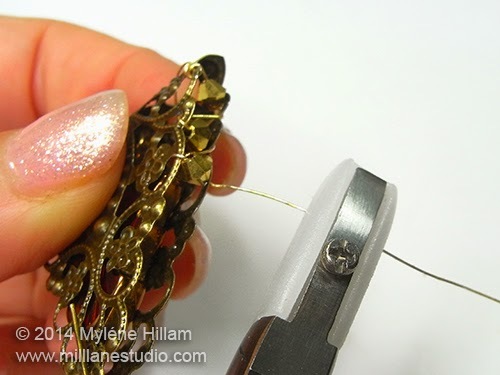 Trim both end wires close to the filigree. 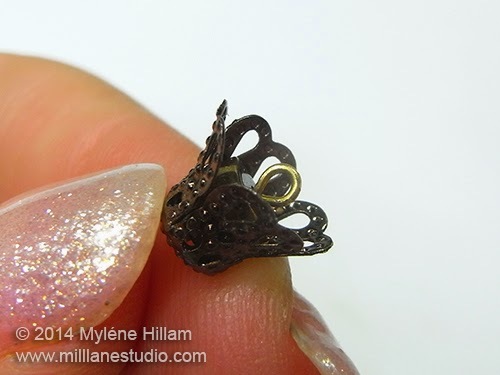 String the bead cap and cube on the head pin. Bend the head pin as close to the cube as you can. Trim to 8mm (5/16"). Turn a small simple loop. Open the eye pin at the bottom of the Christmas tree and attach the basket. 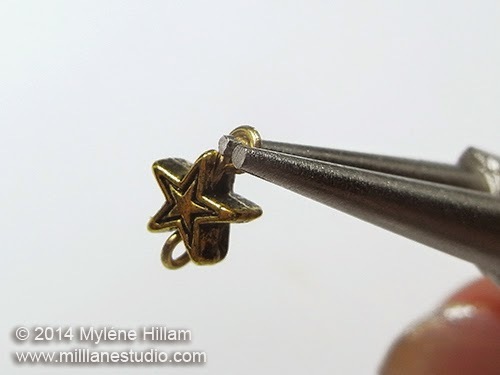 String the star bead on the gold eye pin and turn a simple loop. 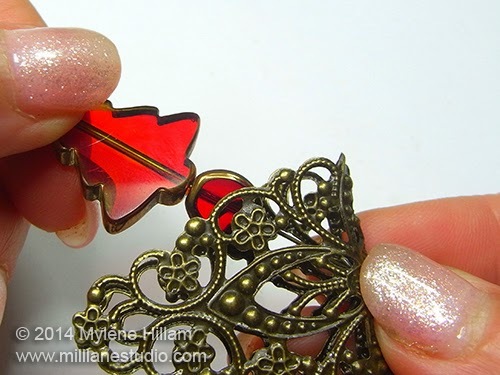 Open the earring wire and attach the star. 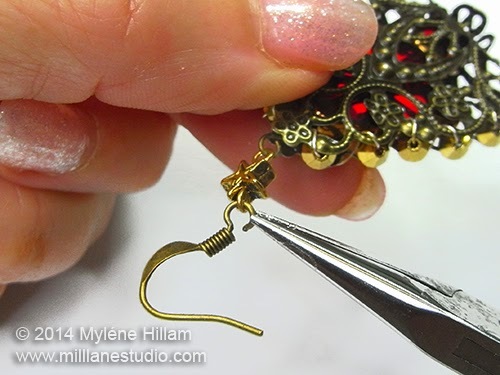 Make a second earring to match. 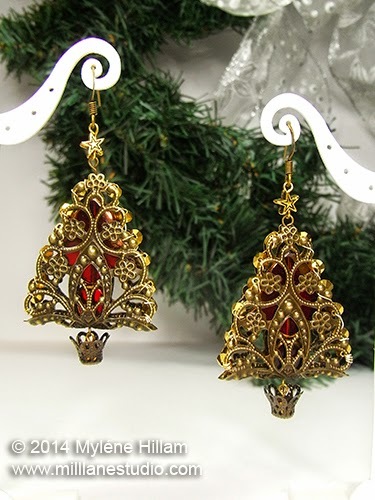 Although these Christmas trees are true statement earrings, the laciness of the filigree gives them an airy and ornate feeling without looking too heavy. 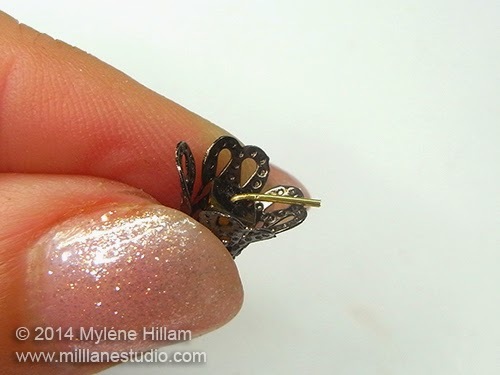 But if you feel that these are too big for you, look for a smaller diamond filigree and adjust the size of the beads you use inside it - you'll still get the same effect, just on a smaller scale. 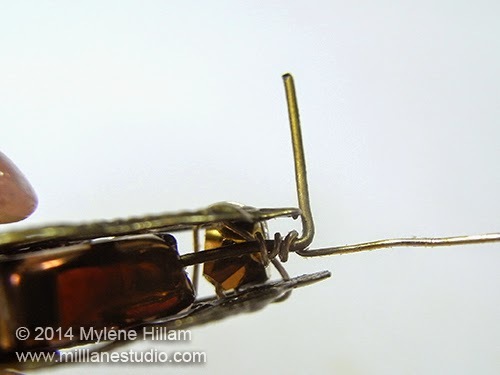 So, we have nine pairs down and just three to go in the 2014 Twelve Days of Christmas Earrings Extravaganza. Have I run out of ideas yet? Nope! I've still got a few more up my sleeve. Join me again in a couple of days for Day 10.